The good thing about dressing well in winter is that you get to buy more clothes than at any other time of year. The bad thing about dressing well in winter is that, ah, you have to buy more clothes than at any other time of year. Fortunately, while your wardrobe might be packed to the rafters, your wallet can at least earn a reprieve; provided you know where to look for stylish staples that scrimp on neither style nor substance, just price. Save the big-hitter brands for your Christmas list, and instead shop from FashionBeans‘ round-up of the 30 affordable winter menswear pieces worth buying. Once temperatures drop to single digits, a thick-gauge roll neck becomes a no-brainer for just about any day you aren’t required to wear a tie. They flatter most shapes, bulk up your torso, and offer an easy way to fend off neck chill. Few other knits flit so seamlessly between off- and on-duty looks. So with a bevvy of affordable wool-blend options on the market, you can well and truly clinch a happy cost-per-wear ratio. Winter is often the catalyst for most guys wearing head-to-toe monochrome. Going all fifty shades of grey for three months of the year, however, can border on boring. Having a few choice accessories to hand is often the easiest way to lift simple looks. Enter: the scarf. A pop of green, burgundy or navy will add depth to an outfit, and give you some much-needed battle armour for when the cold snap bites. Which, all in all, is far better than the neon snowsuits of yesteryear. No longer restricted to South Park and the Gallagher brothers, the parka jacket has at last established itself as a respectable winter stalwart that works just as well over a suit as it does a sweatshirt. For best results, opt for a clean, classic shape in a wearable shade (khaki, grey and navy are the safest choices) and swerve any additional details like faux fur trims or band patches. If those conditions are met, you’ll be quids in with a casual winter coat that will actually beat the cold. Adult men can be sure of three things: taxes, wrinkles and the futility of cheap gloves. This season, convey some semblance of maturity (and add a few degrees to your internal thermostat) by slipping your hands into some quality alternatives. A number of high street brands now produce quality, affordable gloves lined with soft and insulating fleece, so you can keep the digits at the end of your arms warm without causing the ones in your bank balance to suffer. Contrary to popular thought, colour doesn’t have to die along with your suntan in winter. It should, however, take on a darker note, and that rule extends to your tailoring rotation too. Rich tones like burgundy and forest green have appeared across designer suits in recent seasons and the good news is that the look has also trickled down into the affordable price bracket. It’s true what they say: you can tell a lot about a man by his shoes. Especially if his idea of formal footwear is a square-toed loafer in tan that should never have made it past 1997. If you’re planning on wearing a dinner suit this party season, you’ll need some quality dress shoes, but that doesn’t mean you have to skip eating to afford them. If a high-street brand does a half decent tux, chances are they’ll have the patent Derbies to match. Certain hats are responsible for some of the worst style moments in modern times: bowlers, slouch hats, need we even mention visors? A classic beanie, however, has never been subject to such ridicule. Enduring season after season, this simple skull cover is a bona fide menswear essential. And, like a scarf, it’s an easy way to introduce some colour to a look. Just stay well clear of anything with a bobble that Noddy might wear. First worn by Queen Victoria for her garden jaunts, Chelsea boots are all the proof you need that gender-neutral dressing is most certainly ‘a thing’. As a solid anchor to almost every look on the smart-casual spectrum, Chelsea boots provide durable protection from sludge, sleet and snow as the weather turns, all without the added stress of buckles or laces. Like all good crafts, the art of layering is a hard skill to master if you don’t have the right tools. Consider the humble overshirt your perfect starter kit for winter. The workwear staple grafts over a T-shirt, under a jacket, over a sweatshirt and in any combination of those pieces to create an outfit. Stick to muted colours for maximum versatility and prioritise heavier fabrics such as wool, denim or cotton twill to add some much-needed ballast to your cold-weather looks. Chasing the summer sun? Lucky you. But without the correct luggage, it’ll look like you’re off to a run-down B&B in Telford rather than a week in Thailand. A weekend bag is perfect for city breaks, overnight business trips and even as a carry-on for long-haul flights. And if you go classic on the design, there’s no reason why it can’t join you for the nine-to-five too. If your budget doesn’t stretch to leather, look for accents instead, and pick a shade that’ll chime with most things in your wardrobe. Printed shirts needn’t read over-fifties single night at the local pub. Shop wisely and it’s entirely possible to craft a look that’s a long way off retirement. By wisely, we mean a print that’s simple, stylish and contains no novelty images of Santa on a surfboard. Microdots, geometrics and florals on a dark base colour all get the green light, mainly because they look killer peering out from under a leather jacket. Dressing like your grandad is perfectly acceptable during the colder months, especially when you opt for a veteran of the male wardrobe in the form of a shawl collar cardigan. Defined by turned-over lapels that form an unbroken, curved line around the neck, the result is a flattering V-shape similar to a single-breasted suit, which adds bulk in all the right places. The peacoat is possibly the best thing we men have ever gotten from the naval profession (well, after daytime drinking and ‘mum’ tattoos, that is). Sailors from both sides of the Atlantic have sheltered under this cropped, collared coat since as early as the 1700s. Today it comes in various styles, but it’s arguably the double-breasted, broad-lapelled design that lends itself best to the colder months. Stick to true blue tones for plain sailing with jeans and knitwear or smart-casual commuter looks. Bare mankles in summertime may be as divisive as blue cheese, but it’s fair to say the people are united for winter: put some socks on. Warm ones. Rely on wool, or at least a robust cotton, to keep your tootsies toastie from now until April. And there are bonus points to be had if you pick up a flecked pair that will add some texture poking out from underneath a pair of pin-rolled jeans. Gilets, until recently, were quite unfairly labelled almost exclusively as toff-wear. But the winter-friendly piece has graduated beyond country manors and worryingly interwoven family trees. Having been updated by contemporary brands and designers, you can now slot a quilted yet slimline number between your shirt and suit jacket, or over the top of a denim jacket, for a windproof combo that you can lord over any country bumpkin. Party season and hibernation season are, oddly, the exact same time of year. For every Christmas invitation, there’s at least a full day spent horizontal in your comfies, so treat your desperately hungover self to an upgrade. Quality loungewear – the type that boasts a high cotton content and provides enough warmth to send your central heating bill south – can be found for less than you might think, with several brands producing garments that cost about the same as your dry-cleaning bill for that velvet blazer. Good news men who have bodies and like to be warm: the puffer jacket is back, and you don’t have to dress like a teenager queuing overnight at a Supreme drop to wear one. No longer the preserve of nineties boybands and drug dealers, these padded cold-weather forcefields now come rendered in simple block colours and streamlined cuts that make them a sportier, but no less stylish, substitute for an overcoat. The once-jolly exercise of Christmas Jumper Day has soured in recent years, and worse, it’s becoming increasingly hard to avoid. Rather than settle for a flammable novelty piece complete with flashing Rudolph nose, take the sartorial route and opt for Fair Isle. Named after the Scottish island where the weaving technique was born, what you get is a knit that alludes to the festive period, just without the dreadful ‘tickle my baubles’ slogan. Meaning you can still wear it come February. Thanks to geography teachers the world over, corduroy was long viewed with some trepidation. That’s all changed now, and guys have come to see that the fabric is actually surprisingly easy to wear. A pair of corduroy trousers can slot into multiple outfits and offers a tactile point of difference to jeans and chinos. Just remember to stick to a slim-leg fit and small-to-medium sized wale (the space between the ridges) to keep the look modern. Dark jeans are to winter what Haggis is to Scotland. Okay, before you start chomping on denim, they’re not really anything like that, but they’re an important part of any cold-weather wardrobe nonetheless. Whether you want to channel lumberjack vibes with a flannel shirt and work boots or dress down an unstructured blazer on casual Fridays, find a pair that fits you like a glove and wear them until summer rolls back around. Most assume that tailoring is the Goldilocks of men’s wardrobes, working best when it’s neither too hot nor too cold. But that’s not the case. Just as linen styles can work for the height of summer, cold weather needn’t put Savile Row on death row. Simply switch your tailored fabrics as the weather dictates. A winter-weight wool blazer in grey, brown or navy keeps you looking smart even while wading through snow, and can also be paired with dark denim and boots for a handsome high-low combination. A much better idea than piling on jumpers until you’re warm or until you resemble the Michelin Man (whichever comes first) is to invest in some incognito thermals. Standard sausage skins have been given an upgrade in recent years, with brands imbuing their fabrics with NASA-level technology to ensure maximum anti-freeze. Just be ready to explain the long johns if you strike it lucky at the office party. Bing Crosby was pulling a fast one with all that White Christmas talk. Yuletide festivities are, more often than not, dampened by torrential downpours and horizontal sleet than blessed by the fluffy stuff. It makes sense, then, to purchase an umbrella that won’t buckle at the mere sight of wind. Investing the average cost of a round of drinks (still a bargain, if you ask us) will get you details like a sturdy steel shaft, reinforced spokes and a handle that won’t snap off when you fold it up. Now just try not to leave it in a cab. Even the shortest of commutes can seem like an Everest climb in winter, so bolster your kit with a pair of hiking boots to conquer the nine-to-five and beyond. Sure, hiking isn’t the coolest of pastimes. But if you consider some of the more recent trends – fleece, cagoules, technical backpacks – outdoorwear is becoming increasingly on point. Look out for chunky soles for added traction, and you’ll be the Monday-to-Friday Marco Polo in no time. Yes, it’s cliché to bang on about the ‘new classics’, but a check overcoat is just that. Easier to wear than a camouflage flight jacket but noticeably more interesting than a beige trench coat, it’s found a permanent fixture on rails of late. Add the pattern to the versatility of a failsafe silhouette and you’ve got something that that’ll get along nicely with most things in your wardrobe. Just make sure your new purchase fits like a glove, or risk looking like a villain from Home Alone. Party season dress codes are like party season drinking: dangerous, and nobody wants to look the fool. Consider the velvet blazer to be the smart man’s tipple of choice. As a pivot from the usual black dinner suits, velvet blazers still follow the rules in that they’re polished, luxurious and in-keeping with formal events. Plus, you’ve got added texture and depth for a look that’s a lot easier on the eye than you’ll be the morning after. Chalk it up to a more relaxed way of dressing, but the world has fallen in love with the ‘air tie’ (that is, the art of going without one entirely). 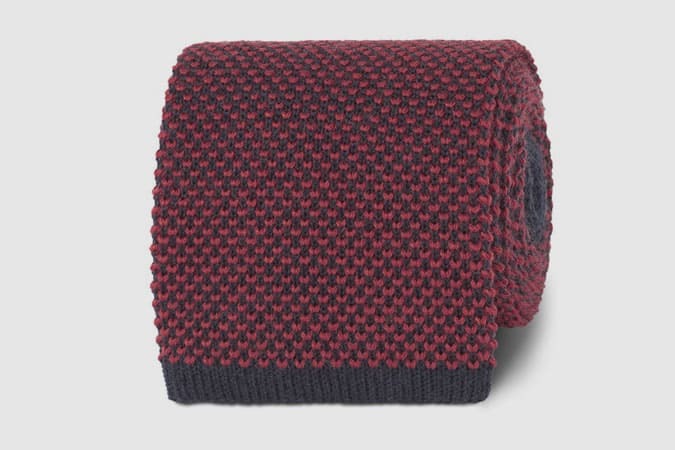 However, for those still required to knot something at the neck, there’s always the less stiff knitted tie. The relaxed cousin of the traditional silk tie, knitted styles can inject some much-needed life in sober looks, and even allow you to switch out your usual work attire for a denim shirt on dress-down days. That’s a winner in our book. A Swiss stamp is universally seen as a mark of craftsmanship, but it isn’t the only one. Respectable watches come from far and wide without the price tag of Geneva’s finest, and a simple, minimalist dial can slot beneath any shirt cuff. The same goes for lightweight jewellery. You don’t need an appointment at Sotheby’s to secure the good stuff, and a reasonable karat can be had in the form of a thin necklace, bracelet or plated ring. Don’t let the plummeting mercury fool you: winter still has plenty of sunshine to offer. It just isn’t very warm. Your eyes should be shielded from UV rays whatever the season, but trend-led sunglasses (and yes that includes shutter shades, in case you’re still yet to bin them) can look out of place alongside a coat. Opt for time-proven shapes – aviators, Wayfarers, Clubmasters – in darker colours to ensure a smooth and much-anticipated transition to the warmer months. If it’s good enough for Robert Redford, Paul Newman and Elvis Presley, it’s good enough for you. The grey sweatshirt is a solid throw-on-and-go option all year round, but it makes for a particularly good winter layer. Wear under an overcoat or worker jacket with jeans or wool trousers. One-hundred per cent cotton construction should prove comfortable on the skin and the pocket.